Exhibitions, acquisitions and research, Children’s Festivals, free tours and curator talks … all these things can happen at TMAG because of your support. Through your donation to the Foundation, TMAG can continue the work of building, conserving, researching, and sharing Tasmania’s stories. How does the Foundation raise funds to support TMAG? You can join the Foundation with an annual gift of $500 for individuals or $750 for couples, and in doing so you will help the Foundation reach its goal to raise more than $50 000 dollars per year. This will be matched dollar-for-dollar by the State Government which instantly doubles the power of your gift. All donations over two dollars to the TMAG Foundation Ltd. are tax deductible. At the heart of TMAG’s Foundation is the very special community of passionate supporters who meet to enjoy Tasmania’s art, science and historical culture of which TMAG is the custodian. By joining the Foundation, you will enjoy the company of people who share your love for the amazing stories, and precious objects and art that TMAG cares for and curates. The Tasmanian Museum and Art Gallery Foundation hosts a range of special interest groups so you can share your passion for art, science or education with TMAG’s curators and specialists. In order to adhere to the rules of the Australian Taxation Office, the TMAG Foundation Ltd. charges a non-tax deductible annual administration fee of $100. This allows you to enjoy benefits such as card access to the Member’s Lounge, discounts at the Museum Shop and Courtyard Café, annual intestate gallery, and invitations to two major exhibition first nights. You will be invoiced for your member renewal at the end of the calendar year and donations beyond the annual member fee will continue to be tax deductible. How do your donations support TMAG? The TMAG Foundation Ltd. contributes funds o TMAG for the acquisition and exhibition of works of art, and objects of historic, scientific, educational or social interest. It will also provides assistance for TMAG's education and public programs, supports specialist research of the State Collection, and assists TMAG in its work as the custodian of the State Collection. Funds raised through the Foundation are not used for TMAG’s normal operating costs. Whether you are new to the growing TMAG Foundation community, or continuing your generous support for TMAG, thank you for donation today. 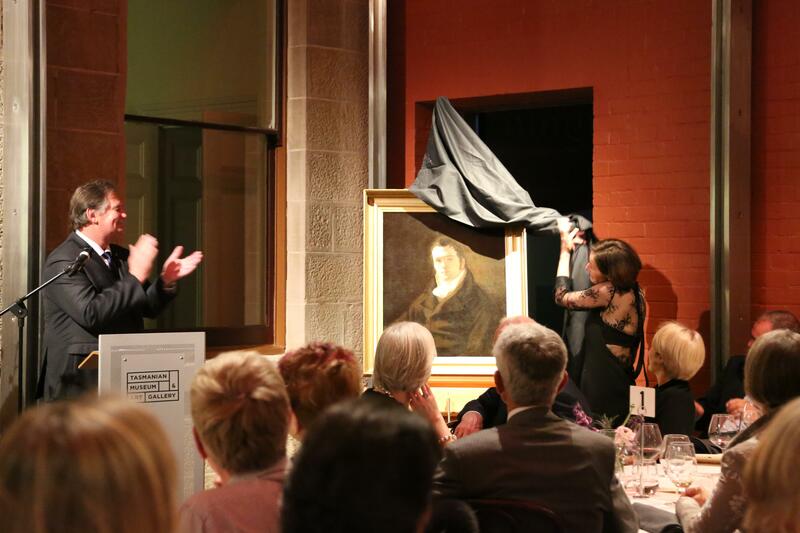 Image below: TMAG's Principal Curator Jane Stewart unveils the Portrait of Henry Foss, by Thomas Griffith Wainewright at the Colnial Colours fundraising dinner. This important acquisition to Tasmania's public collection was made possible by funds raised by the TMAG Foundation Ltd.